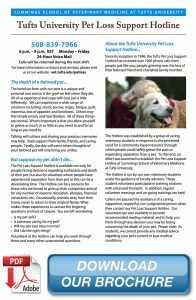 Here are some of the common questions we see about pet loss. The bond we form with our pets is unique and personal and so is the grief we feel when they die. All of us experience and cope with loss just a little differently. Although our hope would be for our animal companions to live a long, healthy life and die curled up in a peaceful sleep, illness or injury may instead cut short the time you always expected to have together. Often we are faced with the heartbreaking decision of choosing the time, place, and method of our pet's death when it becomes clear that they are suffering or when other needs predominate. Choosing to end the life of your pet can be one of the most difficult things you will ever have to do. Thinking about saying goodbye and the subsequent loss is sometimes so painful that you are unable to make any decision at all. We may never know if animals feel the loss of other animals the same way we do. However, it is clear by their actions that they do respond to the absence of their companions. You may see changes in their eating and sleeping habits, they might appear depressed, or may constantly search for their missing friend. Many will need time and extra attention from loving owners to adjust to their new life. While we may not know the depth of their grief, we can help them get through the experience as they also help us.